Tuesday, April 23, 6–8 p.m. Effective and appropriate science-ethics communication is essential to help communities across Alaska address environmentally-related challenges with justice, compassion and humaneness. This symposium includes presentations by school librarians from the Anchorage School District and UAA Environmental Ethics students on understanding how scientific and ethical information flows into and is absorbed or rejected by some of the youngest members of our community and the state’s future leaders and citizens. Join us as we identify a range of strategies to engage the diverse publics across our city and state. The symposium is sponsored by the UAA Department of Philosophy, National Library of Medicine, Environmental Health Information Partnership (EnHIP) and Oak Ridge Associated Universities. From this website you can select specific committees. Or send emails from the Senate or House website. Thanks to the Rasmuson Foundation, UAA and APU have access during 2019 to the HistoryMakers website and to their collection of oral histories of African Americans. The grant program will also increase the number of oral histories for African Americans living in Alaska. There are currently 275 Alaska stories on the website. The Consortium Library will be closed today, Monday and Tuesday. 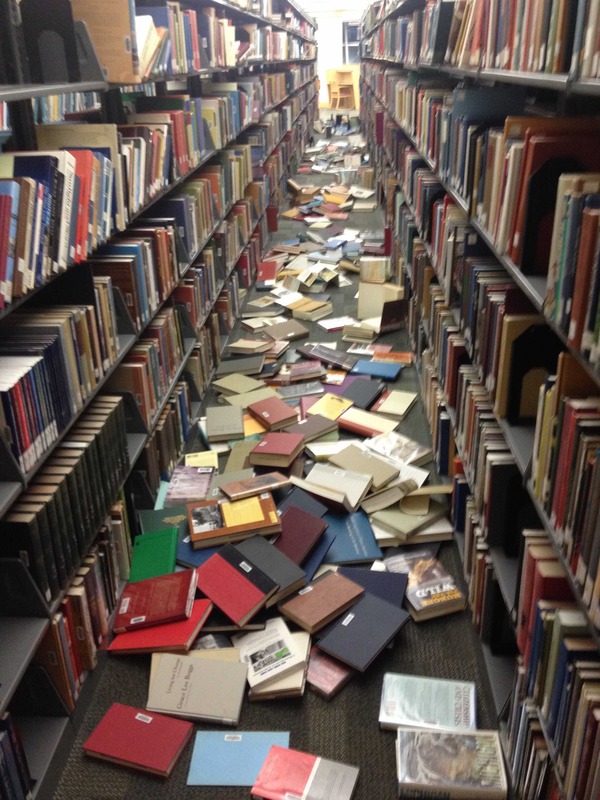 The goods news is that there were no reported injuries in the Library during the earthquake on Friday. While there was no major structural damage to the building and its exterior, there was damage inside. Water from a broken pipe in the 4th floor mechanical area leaked into the collection areas in Archives and AMIPA on the third floor. Work is already underway to stabilize the damage and AMIPA currently has equipment and materials drying in Library 307. There were three locations where glycol leaked from the heating systems and on to the floor. The worst leak was near the food vending machines at the north entrance. In numerous locations the suspended ceiling has partially fallen and there is the danger of further collapse in these areas. A large ceiling light fell to the floor in Library 302a, objects flew around in the office spaces, and pictures and signs were damaged. 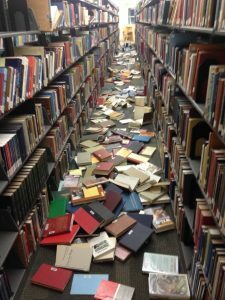 By far, the biggest impact is on the library’s collections where at least 100,000 volumes fell to the floor. Again the good news is that the shelving performed as it was designed with no buckling or toppling. The next steps before opening the library are to stabilize or repair the ceiling areas and to start the huge job of reshelving more than 100,000 volumes. We are restricted to small groups reshelving materials given the repair work that is needed around the building in the ceilings. Small Changes that Make a Big Difference, an open forum for faculty, is co-sponsored by Dr. Claudia Lampman, Vice Provost for Student Success, and the Center for Advancing Faculty Excellence. Participants will be familiarized with insights into student success based on recent student performance data, and will explore specific approaches to teaching and learning that may improve retention; build connections to faculty, classmates, and the institution; and increase the likelihood of course completion. Wednesday, Dec. 5, LIB 307, 2:30–4p.m. For questions please contact Shawnalee, Director, Center for Advancing Faculty Excellence, at sawhitney@alaska.edu or 907-786-4645. The Consortium Library is responding to student requests and added a space where you can take a break, buy a snack or beverage from the vending machine or heat up your food in the microwave, even during after hours study and the weekend. This room is located right by the North entrance.